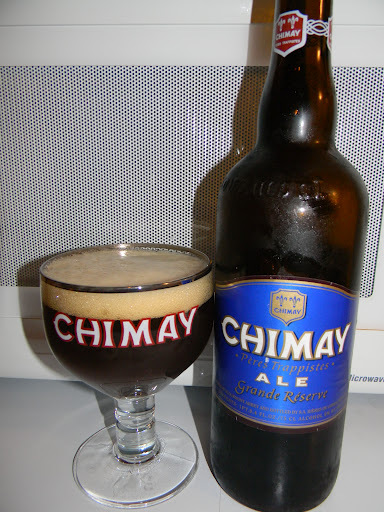 Chimay | Beer Apprentice - Craft Beer News, Reviews, Interviews and Info. Hello everyone. Thanks for checking back in on another craft beer review. For today’s drinking pleasure I’m going to be reviewing the Chimay Premiere (Red) produced by Bieres de Chimay S.A. located in Baileux, Belgium. It’s been quite some time since I last had this brew, so I’m really looking forward to trying it again. From the website, chimay.com, we find this bit of info regarding the beer. 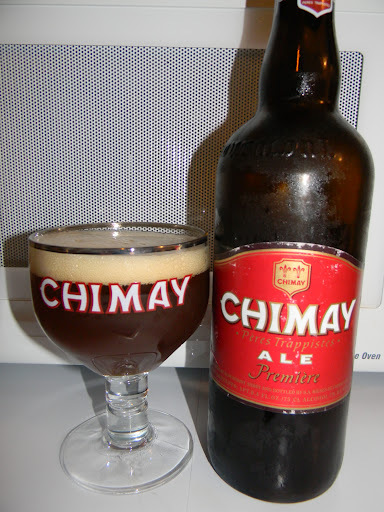 The Chimay Red Cap, or “Première”, in 750 ml bottles, is the oldest of the Chimays. This Trappist beer possesses a beautiful coppery colour that makes it particularly attractive. Topped with a creamy head, it gives off a slight fruity apricot smell from the fermentation. The aroma felt in the mouth is a balance confirming the fruit nuances revealed to the sense of smell. This traditional Belgian beer is best savoured at cellar temperature (10 – 12°C). This brew comes in a 25.4 oz. bottle and it has an ABV of 7.0%. It poured a hazy, burgundy/ruby/brown mixture of color. The crown was eggshell colored and very nicely sized. The texture was kind of soapy and fizzy with some small compact bubbles. The retention time was adequate and it left a thin skim of lacing on the sides of the chalice. The nose was not very strong or robust, although it was balanced pretty well. Hints of spicy clove and coriander along with some touches of caramel malt. It presented a very yeasty, baked bread tone with just a light hint of fig. Mostly straight forward I thought. Not that that’s a bad thing however. The taste burst through with a spicy clove at the beginning. That was followed by some ever present Belgian yeast, lightly toasted breads and delicate caramel sugars. Some dark fruits of fig and date seemed to be more pronounced in the taste than they were in the aroma. I never really found any inkling of apricot though. Oh well, a nice bitter bite finished things off. The mouthfeel was medium bodied. It was somewhat sharp on the initial intake with a lively carbonation that stung the front of the tongue for several sips. Overall, it was very crisp, but not as dry as I remember it being in the past. It did leave a decent amount of flavor behind on the palate despite the fact. The Chimay Premiere is still a solid all around beer. One that I’m sure I will continue to pick up from time to time in the future. It’s very enjoyable, highly drinkable, represents the style very well and is so easily obtainable that I sometimes overlook the fact that it is such a well made beer. I don’t necessarily think it’s the best “Belgian” styled beer on the market, but it shouldn’t be taken lightly either. It could be enjoyed at any point during the year by just about any level of craft beer drinker. So, if you haven’t had the Chimay Premiere (Red) in a long time, pick up a bottle next time you see it and revisit a classic. I think you may find a new appreciation for the brewery. Thanks for checking back in on another craft beer review everyone. For today’s drinking pleasure I’m going to be having a Chimay Grand Reserve produced by Bieres de Chimay S.A. located in Baileux, Belgium. This beer has long been a staple in the craft beer community and it’s been some time since I last had it, so I figured I’d give it a proper review. Let’s get to the website, chimay.com, and see what kind of info we can find on this brew. “Grand Reserve” in 750 ml bottles is a dark Trappist beer with a powerful aroma, the complex flavour of which improves across the years. It was first brewed as a Christmas beer, explaining the presence of a “vintage”. The Chimay “Blue” comes in a 25.4 oz. bottle and with an ABV of 9.0%. The beer was a hazy, dark burgundy to brown color with a light tan head that was poured to a real nice size. It was very smooth, but kind fizzy. The retention time was adequate and the lacing looked pretty good too. After settling it left a thin skim on top of the liquid for the entire drinking experience. Pretty sharp looking brew right here. The nose revealed hints of sugary raisins and light notes of fig. Quite bready with bursts of that Belgian yeast. Some welcomed spices of pepper added a bit more complexity. I never really detected any caramel or toffee malt to be honest. Overall, not terribly strong or robust, however very well balanced and proper for the style. The taste seemed to be a little more forceful. The raisins and figs became more pronounced. As did the alcohol. The peppery spice added some kick while the breads and smooth Belgian yeast really created a “round” flavor profile. The caramel malt developed some as the brew warmed considerably. The taste was rich, sweet and harmonized. Very tasty to say the least. The mouthfeel was medium bodied. Smooth, kind of creamy, a touch chewy and dry. The carbonation was very nice and a decent waft of warmth was felt at the back end for the first few sips. More than enough flavor was left behind after the swallow. A very nice aftertaste with this one. In conclusion, I really like this beer. More than solid all around. It gets better and better with each passing second. In my opinion, the entire Chimay line is sometimes overlooked or taken for granted due to the fact that they are so readily available. I’m guilty as well. This brew is very easy to drink for 9.0% and it has enough complexity to ponder and warrant discussion. It’s very appropriate for the style also. If for some reason you guys have not tried the Chimay Grand Reserve or if it has been a while since you last did so, pick up a bottle and enjoy the next time you see it. I know I sure did. I need to start buying this on a regular basis again just to have an enjoyable and flavorful beer at my disposal when the mood hits. As always, be sure to let me know what you think of this brew if you’ve had it. For today’s craft beer review I’m going to be trying a Chimay Cinq Cents produced by Bieres de Chimay S.A. located in Baileux, Belgium. It’s been forever since I last had a Chimay of any kind. Of the beers they produce, this particular brew was always good, so I figured I’d give it a more formal review. Let’s see what the website, chimay.com, has to say about the Cinq Cents. The Chimay Triple, last-born of the Abbey, is labelled “Cinq Cents” on the 750 ml bottle. Of a golden colour, the Trappist beer combines sweet and bitter in a rare balance. The beer’s aroma felt in the mouth comes from the hops’ perfumes: above all, they are fruity touches of Muscat grapes and raisins, even ripe apples. This traditional Belgian beer is best savoured fresh at a temperature of from 6 to 8°C. The Cinq Cents has an ABV of 8.0% and it comes in a 25.4 oz. bottle. This brew poured a very hazy orange color with some yellow highlights around the edges of the chalice. The crown was very white in appearance and it was of good standing. It was kind of fizzy, but soft. The retention time was more than suitable and the lacing was above average. The head settled to a smooth, almost creamy film that lasted nearly the duration of the drink. The nose brought forth a very nice dose of yeast and bready goodness on the initial whiff. I got quite a bit of spice too. Hints of pepper and clove really start to stand out as the brew opened up a bit. Some fruity hints of apple and white grapes along with a very mild tone of banana gave it a bit more complexity, not to mention a touch of sweetness. Very well balanced and harmonized in my opinion. In the taste, the clove was the most distinguished aspect upon the first sip or two. The pepper seemed more subtle, however still noticed. The fruits came in after a while, but they were quite a bit more relaxed also. I could still determine the grapes and apples, but the banana was very subdued. A touch of alcohol was noticed too, however once the bready and yeasty components started to make themselves known, they really “tied the room together”. Overall, very tasty and even throughout. The mouthfeel was of medium strength. It was smooth, dry, crisp and refreshing. The carbonation was nearly perfect. A small amount of warmth was felt from both the pepper and the alcohol and the palate was left with plenty of flavor to ponder long after each gulp. Man, this is still a really nice beer. I’m glad I picked up a bottle. All around, it’s more than solid. It’s very easy to drink and it has more than enough character to satisfy any craft beer drinker. I doubt I wait as long as I did this time to pick it up again. In fact, I might start to make a point of picking up a bottle every so often. The drinkability was excellent and with the warmer days right around the corner, I think the Chimay Cinq Cents would fit the mood perfectly. 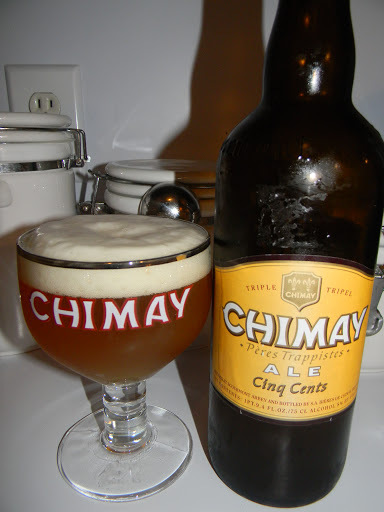 Have you guys every tried anything from Chimay? What have you had? Did you like it? Be sure to leave a comment if you wish and tell me all about it.